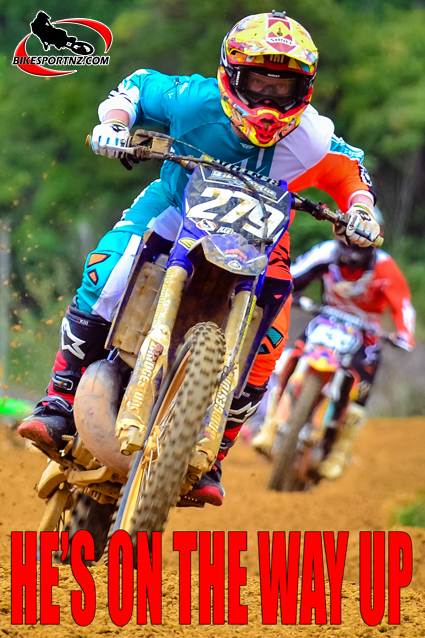 Otorohanga’s Hayden Kanters left his best until last at the annual Waikato Motocross Championships, on the outskirts of Te Kuiti, at the weekend. The 18-year-old plasterer knew he was in for a fight when he saw national champion Josiah Natzke, from Hamilton, line up in the MX2 (250cc) class on Sunday, but this was Kanters’ home track and he wasn’t about to be intimidated. Natzke (CMR Red Bull KTM 250) dominated race one, leading from start to finish, but Kanters kept Natzke honest and crossed the line in second place. With his home town fans cheering him on, Kanters (Bike Torque MX Antix BikesportNZ.com Yamaha YZ250) had put up a great fight. But a feisty attitude is only part of the equation and, when luck did not favour him in the second of his three MX2 races and he crashed early on, Kanters needed to rely heavily on skill, strength and tenacity to claw his way back into the fight. Kanters charged from last place on the track to catch the leaders, eventually forced to settle for sixth place, with Natzke again claiming the win. Then came the final race of the day and retribution time for Kanters. The Yamaha man snatched the lead right out of the start gate and simply “checked out”, winning the third race ahead of Natzke. “I knew I had to be at my best, not leave and openings for Natzke to get past … and just not make any mistakes. It was a great way to end the day,” said Kanters. This result was enough to earn Kanters overall runner-up spot for the day and also give him a huge confidence boost ahead of the summer motocross season. Third overall on Sunday was two-time former national 250cc champion Michael Phillips (The Honda Shop Racing Team CRF250), of Rotorua. The next major showdown between Kanters, Natzke and Phillips will likely be at the Auckland Motocross Championships, near Pukekohe, on December 7. After that, the riders prepare for the annual Whakatane Summercross on December 28, followed by the New Zealand Motocross Grand Prix at Woodville on January 25 and then the four-round 2015 New Zealand Motocross Championships, which kick off in New Plymouth on February 8.